Without federal dollars, the future of health information exchange hangs in the balance. Earlier this year, media reports suggested that an ambitious effort by the Metropolitan Chicago Healthcare Council to launch a Chicago-area HIE was in trouble. The problem, according to an article in Crain’s Chicago Business, is that some health care organizations are reluctant to participate because of cost concerns and questions about how much value the HIE will actually provide. While project officials are adamant that the HIE will roll out later this year, the story serves as a reminder that while these exchanges are growing in number, there are no guarantees they will ultimately be successful. The passage of the HITECH Act provided billions of dollars in financial incentives and implementation support with the goal of significantly increasing the speed of adoption and the meaningful use of both EHRs and HIEs. According to KLAS Research, as of 2011, there were more than 225 public and private HIE initiatives in the United States, a marked increase from previous years. The number of private HIEs increased from 62 in 2009 to 161 in 2011, while the total of public exchanges increased from 37 to 67 over the same time period. However, according to “Following the NeHC HIE Roadmap: Four Routes to Success,” a report issued by the National eHealth Collaborative (NeHC), because many of these exchanges received most of their revenue from grants—funding that disappeared as of late April—a large number are not financially sustainable. In putting together the NeHC report, a sustainability workgroup collected and analyzed data from 16 existing HIEs to come up with an aggregate financial statement indicating what it takes for HIEs to be financially solvent. According to Berry, it also identified where the gaps are between unprofitable and profitable exchanges. In any event, there does appear to be a large price discrepancy across markets, she says. This could be the result of the governance model or any number of other factors, including pricing strategies and market competition. It does, however, indicate the market is price elastic, meaning similar customers from different markets are willing to pay higher prices for similar products. “It comes down to developing the products and services the market wants and pricing them appropriately so you can cover expenses and investment in new product development and growth,” Berry says. According to the NeHC report, the average profitable HIE was able to invest $7.1 million in grants into product development compared with the average unprofitable HIE that was able to invest only $1.3 million. The report went on to suggest that this contradicts a common assumption that sustainability may be HIE age related, and instead means that it is more a reflection of the amount of money invested and the development of new products over the HIE’s life. The IEHIE actually is a bit of an experiment since it’s a public/private hybrid in the sense that it combines public and private exchanges. It was founded in 2009 as a public HIE by the county medical societies of San Bernardino and Riverside and the Hospital Association of Southern California. 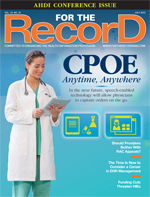 “We realized early on that sustainability is really about growth and expansion, and that there were a lot of enterprises out there—not superlarge but not small either—that need an HIE internally for their organization, particularly to connect to multiple hospitals or providers in their system,” Swafford says. The IEHIE targeted these health care systems, using what Swafford calls an “extraordinarily powerful” technological platform (provided by HIE vendor Orion Health) to provide connectivity to a larger community while maintaining private HIE services within their organizations. “I have to say that by being flexible and willing to see beyond the traditional delivery of services, we’ve been able to grow and expand and maintain ongoing sustainability,” he says, adding that the IEHIE’s experience can serve as a model for some HIEs. While the term “sustainable” should be part of a definition of success, there’s more to it than that, according to Kim Pemble, MS, CPHIMS, executive director of the Wisconsin Health Information Exchange, who says a thriving HIE provides measurable value that its participating stakeholders are willing to pay for. After all, he notes, the idea behind HIEs is all about getting information to clinical decision makers at the point of care in as accurate and complete manner as possible. While issues related to financial sustainability remain a key challenge for HIEs, there are other barriers that need to be cleared as well. There’s also the matter of reaching agreement among the HIE’s constituents. “Trying to get several different health care providers across a health information exchange to actually come together to agree and find a consensus [regarding these policies] becomes quite a big issue,” Kannan says. Competition has emerged as an issue that may significantly impact HIE participation rates. For example, competition from HIT system vendors and other HIE efforts were cited as challenges by 68 and 63 respondents, respectively. Berry says the trend toward consolidation throughout health care “creates some new competitive dynamics that are changing the game a bit,” even in communities that may sport HIEs with long records of success. In these cases, a hospital exchanging information with the regional HIE may be acquired by a larger organization and subsequently change its strategy and pull away from the local exchange. Berry says another challenge revolves around the ability of technology vendors to support interoperability and their flexibility—or lack thereof—when it comes to offering solutions to HIEs. “We hear that the trend is toward needing to have those vendors provide a real flexible approach,” she says.